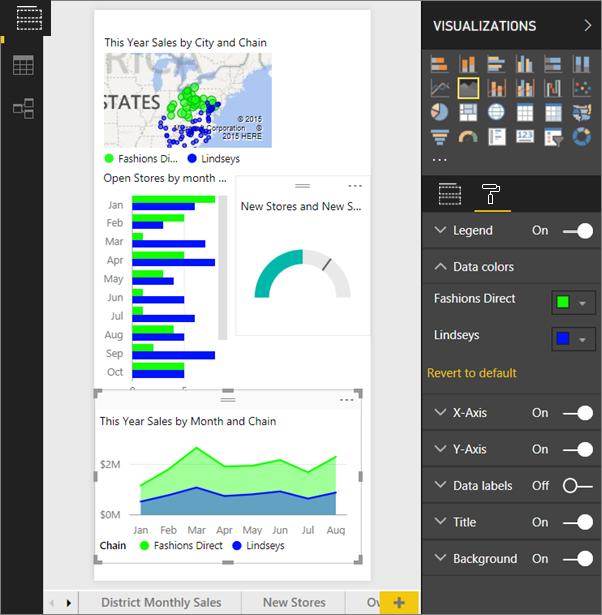 Use the full capabilities of Power BI to create special report pages, called Cortana answer pages (and sometimes called Cortana answer cards) designed specifically to answer Cortana questions. 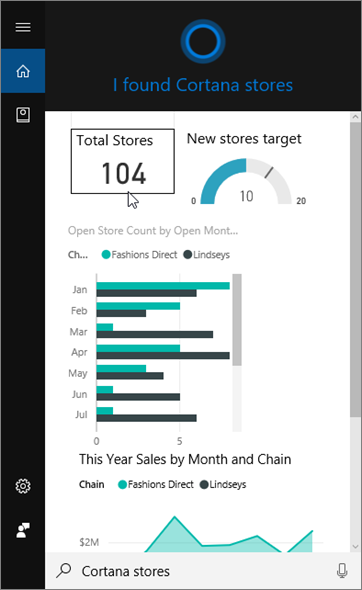 If you are trying out the Cortana and Power BI dashboard preview, you can skip the rest of this article. There are no setup requirements for Cortana to be able to search your Power BI dashboards. You have four documents that guide you through setting up and using Cortana for Power BI. If you haven't already, start by reading article one. Article two is especially important because it describes some steps you'll need to take before you can begin using Cortana answer pages. We recommend starting with a blank report page. 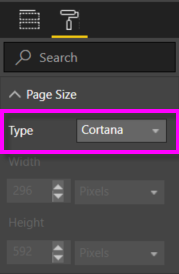 In the Visualizations pane, select the paint roller icon and choose Page Size > Type > Cortana. Create a visual or a set of visuals that you want to appear in Cortana in response to a particular question (or set of questions). At the moment, Cortana answer pages don't support images having static images shown in them. You can include images in table or matrix visuals that are dynamically pulled in based on a URL in your data. Ensure that all visuals fit within the page borders. Optionally, modify display settings, data labels, colors, and backgrounds. Name the page and add alternate names. Cortana uses these names when it searches for results. In the Visualizations pane, select the paintbrush icon and choose Page Information. Enable Q&A for this visual by moving the slider to On. To improve results, avoid using words that are also column names. Optionally, if your report has page level filters, you may want to set Require single selection. Cortana will only display this report as an answer if one, and only one, of the filter items is specified in the question. Require single selection can be found at the bottom of the Filters pane. You don't have to set Require single selection to ask Cortana to display a report with page level filters. For example “show sales for Charlotte Lindseys” will display the answer page regardless of the Require Single Selection setting. "show sales by store name," this answer page does not appear because you did not include any of the items in the required page level filter. "show sales for Cary Lindseys and Charlotte Lindseys," this answer page does not appear because you specified more than one item from the required page level filter. "show sales for Charlotte Lindseys," this answer page appears. = "show sales" this answer page does not appear because you didn't include any of the items in the required page level filter. Before your Cortana answer page can be accessed by Cortana, you will need to Enable the dataset for Cortana. How does Cortana order the results? Results with high scoring answers (such as a complete match of a specified page name) appear first as a best match in Cortana. Multiple best matches can appear if there are multiple Cortana answer pages in Power BI. Medium or lower-scoring answers, such as answers not based on the name of an answer page or a question with words not understood by Power BI, are listed as links below best matches in Cortana. When a new dataset or custom Cortana answer page is added to Power BI and enabled for Cortana, it can take up to 30 minutes for results to begin appearing in Cortana. Logging in and out of Windows 10, or otherwise restarting the Cortana process in Windows 10, will cause new content to appear immediately. Still can't get Cortana to work with Power BI? Try the Cortana troubleshooter.